The whole world is facing economic crisis. For creating additional, we have to slice the extra cost and should also take most favorable deployment of the resources. I am convinced that India will lend a hand to entire world by generating such extra and will also administer prospect to face the challenges. The fraternity of Pioneer Institute is endlessly targeting the innovative stature and sphere of education and research to outfit the society by educating young professionals. I am happy to observe the steady growth and expansion of Pioneer Society. The Society was established with a solemn wish to offer quality education and training of the world class level. We are dedicated to make the students secure, conversant and sensible. 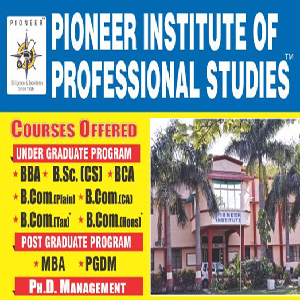 Pioneer Institute provides a wide spectrum of courses in the area of Management and Information Technology. I am grateful to all the parents and Institutions who have extended cooperation and support to us in translating the dream into reality. I am very much optimistic that our undertaking to serve humanity through enlightenment of the ignorant by dispelling the dimness will remain a reality during the times to come. I applaud you in contributing to the success of my Institute and visiting the website and wish you a very happy and prosperous new year.